When you write epic fantasy, you have the privilege sit before a blank page (well screen nowadays). You make up all the rules. If you want these creatures to have different colored skin, pointed ears, horns, or magic, go for it. If you want to have unicorns, dragons, or any creature you make up, it is your right. So what’s with the pipe? I know, Tolkien smoked, but he strode around Oxford in tweed, talking languages no one else remembers. In fact, there are a lot of characteristics about the master that we can adopt. I think the secret lies with those who puff. I used to smoke a pipe for several years, seeing it as a compromise, a halfway house between smoking cigarettes and not. I loved my pipe. I craved the taste, loved the touch of the warm bowl, and enjoyed packing the pipe correctly, even cleaning it. All day, I looked forward to that time when I could put my feet up and puff the worries of the world away. I succeeded in giving up cigarettes for the pipe, but giving up the pipe proved tougher than I could imagine. This is not an article about smoking cessation, but even eight years later, if someone passed by me with his briar, or even is sitting a hundred feet away (given the correct wind), I will smell it, yearn for it, crave it for the rest of the day … maybe for the rest of my life. Perhaps this is why we continue to give our characters an opportunity that we are denying ourselves. Are we being foolish? Indulgent? I recently read a scene to my writer’s group in which, shortly after a bloody fight, the characters (those who survived) sat down and puffed their pipes. A colleague questioned me having my characters smoking in a YA novel. Fair point, I thought, until I realized that she had not objected to me exposing my tender, young readers to battle, killing, blood and gore. I guess that one man’s poison is…well poison is poison. I shall have to sit and think about this. Now where’s my pi–. 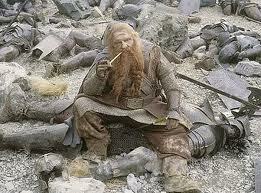 Why do you think pipe smoking is a mainstay in fantasy novels? This entry was posted in General Fantasy and tagged A Gardener's Tale, Alon Shalev, cigarettes, dragons, elfwriter, elves, epic fantasy, fantasy novels, Gandalf, Oxford, Pipe, poison, smoking cessation, The Accidental Activist, Tolkien, unicorns, writer's group, YA novel. 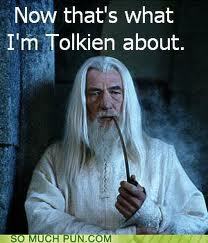 It is posible, that the influence to Tolkien start smoking was the Father Francis Morgan, who use the Pipe. I consider that the Tabacoo was a typical pattern of Tolkien way, but not essential, although i can not imagine their characters without smoking. Although i must recognise that i am not smoker. Caffeine is much worse than the occasional pipe smoke, yet nobody tries to legislate against coffee addiction (yet). Tolkien lived until age 81, and other smokers even older; you can abuse anything, food, drink, games… Use moderation and wisdom and enjoy the simple things as a Hobbit would. Nothing wrong with a pint and a pipe now and again. Thank you, John. I guess it is the moderation that is the tricky part. Respectful the contains of the cigarretes a part of the nicotine has 400 substances dangerous for the organism. Depend who use tabacoo, but generally is bad for the organism, who say Paracelsus All substance depend the measure is poison, or medicine. However the tabacoo have not good things. The Tolkien´s age the most part of the population smoke and it is logical that the people consider good the tabacoo, but now the thing is totally diferent. Frankly the Tolkien´s talent is for other thing and the tabacoo is secondary, although i can not imagine your characters without smoking, like i can not imagine the character of P.G. Wodehouse, G.K Chesterton`s and Jhon Ford without taking a pint of alcoholic dreams. A character in my book smokes and drinks and the book could be a YA. there are people in the world that do both and to pretend that your teen will not see that is ridiculous. It doesn’t mean they are bad people, it just means they are different than the ones who don’t. I wanted my characters to feel real, and there are those who smoke in the real world.